If you’re an Elvis Presley fan, or you loved the 1992 movie “Honeymoon in Vegas” with its Elvis impersonators: the Flying Elvises, Utah Chapter, this is an off-Broadway show you don’t want to miss. And you only have one more week to get caught up in the Elvis-Drac Frenzie frenzy. 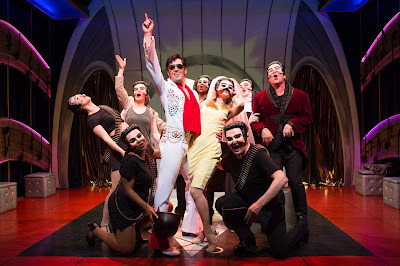 The campy musical comedy “Attack of the Elvis Impersonators” at The Lion Theatre at Theatre Row in New York City is about to bid Elvis a fond goodbye. The musical, which opened in June, features a crazy cast of swooning fangirls, a supervillain, a social media star, religious rockers and a fearless leader, Elvis Presley (aka Drac Frenzie). The original score and story by Lory Lazarus revolve around Drac, a world-famous heavy-metal rock star who is infused with the spirit of Elvis. What happens next is Drac’s re-invention from burnout to world hero as he becomes the leader of the Elvis impersonators and the new religion of peace, Hound Dog. Also key in the story is Prissy Bordeaux, a news reporter whose obsession with Drac leads to her own metamorphosis into Drac’s sidekick and eventual love interest. Played by Eric Sciotto (Something Rotten, The Mystery of Edwin Drood), Drac Frenzie has the moves and the vocal chops to fit his multiple personalities. Laura Woyasz (Wicked, The Marvelous Wonderettes) is his worthy partner. 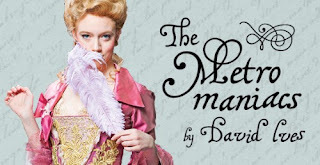 The final performances are Thursday at 8pm, Friday at 8pm, Saturday at 2pm and 8pm, and Sunday at 3pm and 7:30pm. For tickets, visit www.telecharge.com, or call 212-239-6200.
affordable health insurance coverage new hampshire This is my first comment here so I just wanted to give a quick shout out and say I genuinely enjoy reading through your blog posts.